Merry & Pippin Together Again! 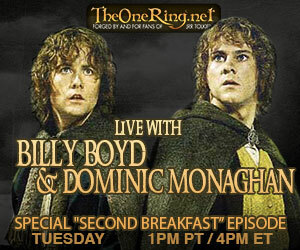 EXCLUSIVE Dominic Monaghan & Billy Boyd *Live* On TORn TUESDAY Webcast! It has been a very long while since both Merry & Pippin were back together causing mischief! TheOneRing.net is quite thrilled to host our *EXCLUSIVE* live webcast featuring our very own Billy Boyd and Dominic Monaghan on a special edition of TORn TUESDAYS (at a special earlier time)! Join host Clifford Quickbeam Broadway as we broadcast live from Meltdown Comics in the heart of Hollywood, at 1:00pm Pacific Time on Tuesday afternoon, not the usual 5pm! Dom will be talking about the launch of his new series on BBC America: WILD THINGS WITH DOMINIC MONAGHAN and Billy will bring the musical goods as his band BEECAKE have just launched a wonderful new album, Blue Sky Paradise (available on iTunes Store)…. You will see Beecake perform *live* at our huge Oscar Event on February 24th: The One Expected Party! The two young hobbits have expanded their careers to great heights, and here is your chance to catch up with them both! You can bring your questions and join the built-in chat here on our Live Event Page, or turn on your camera and join on Stickam here. REMEMBER: We begin the show at 1:00pm Pacific Time! Check here for round-the-world times for the start of TORn TUESDAY.